out today at 699$ (695€) exclusive at apple store. 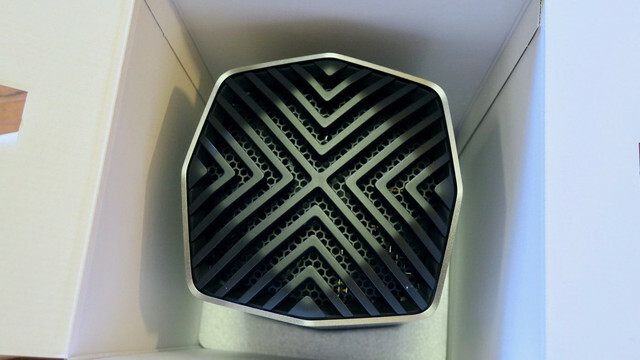 the first step for a new modular Mac Pro ? Last edited by Ludovico Bettarello on Thu Jul 12, 2018 2:18 pm, edited 1 time in total. Radeon Pro 580 (8GB), which is < GTX 1060. Maybe in Resolve it performs well. 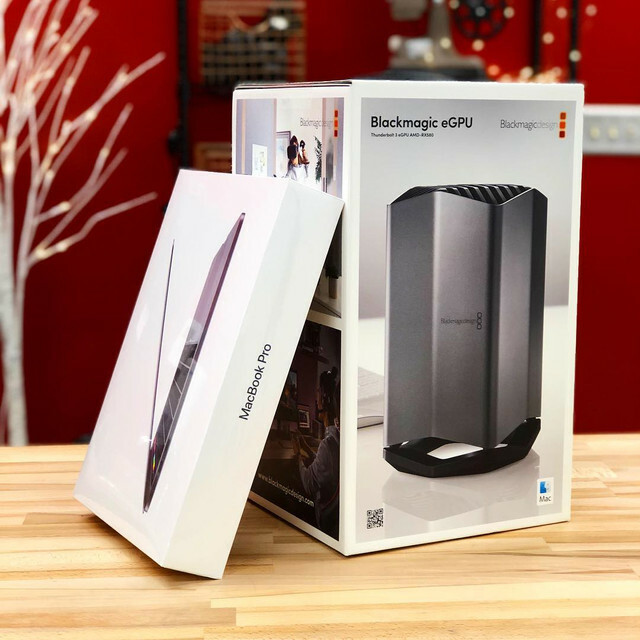 Blackmagic is now selling their own external Thunderbolt 3 GPU. Though I’m glad they put one out, I’m disappointed that you can’t swap the gpu inside. Well I wonder if someone could crack it open and swap it, even if it's not 'supported'. 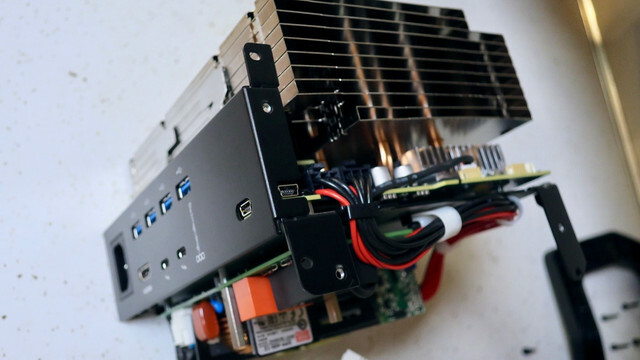 I would imagine they are just using a standard pcie card with maybe a custom gpu and custom cooling. Obviously it wouldn't be easy to do but it might be possible. Anyone know how a 580 compares to a 1080 ti in egpu for resolve? There was a recent OS update for Macs that added official support for eGPUs; it didn't take BMD long to capitalize on it. 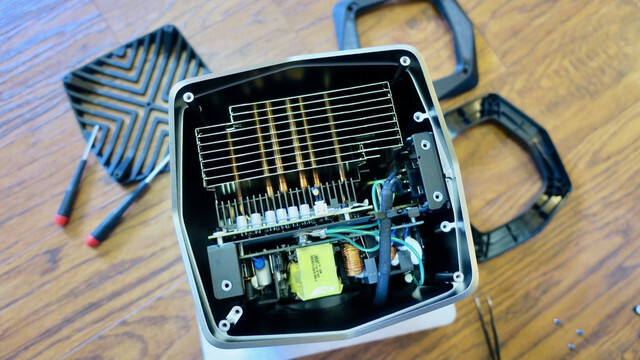 I suppose this could be a first step toward modular Mac Pro, but it looks more like a solution for all the MacBook Pro owners who can't run Resolve well because of the relatively puny internal GPUs on those machines. 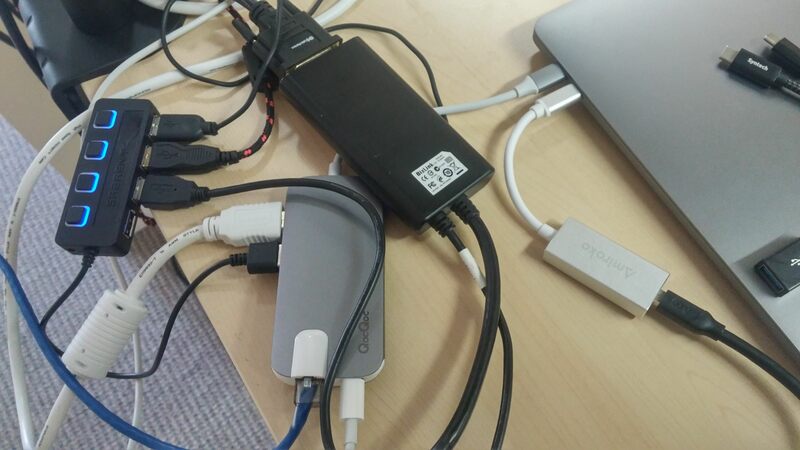 This makes Resolve a much more feasible option for people who want/need to use a Mac laptop. Obviously you're not likely to be lugging this thing around with you in a briefcase, but when you need to sit down at a desk in front of monitors and do serious editing and color grading, this would make it possible. Seriously disappointed it doesn't include a built-in Decklink Mini Monitor. Too bad it isn't for Windows too. Yes, they could add HDMI/SDI output from this box which would be serving a role of monitoring solution. In this case it would have to be some bespoke solution (which takes signal from eGPU and changes to video signal, so data doesn't need to travel to host machine). Other option is to add "standard" BM card, but then you would need 2x TB3 to host machine as single link would be not fast enough. Andrew Kolakowski wrote: Other option is to add "standard" BM card, but then you would need 2x TB3 to host machine as single link would be not fast enough. Not necessary. With Resolve all output frames are generated on the GPU so they can simply be DMA'd to the Decklink and no roundtrip to system memory is required. I'm pretty sure it is already implemented this way. Yes, maybe this is possible, but it's not obvious in case of "standard" BM card. It should be possible with bespoke solution though. The GPU in it is too old to be of interest to Windows users who can use current generation AMD GPUs (Vega) or nVidia cards. Kind of sad really; even the just announced today MacBook pro still has that geriatric GPU in it, while AlienWare is offering an overclocked hexacore i9 in its 15" laptop, but teamed with an nVidia 1080 GPU... in the same price range. It's clearly targeted for Apple, so this is probably why it's AMD. Fact that it's bit outdated and non-replaceable model is bad news. Use of modern card would require Apple to work hard on new drivers and compatibility. Looks like Apple is more busy with new emoji design and other crap like this. 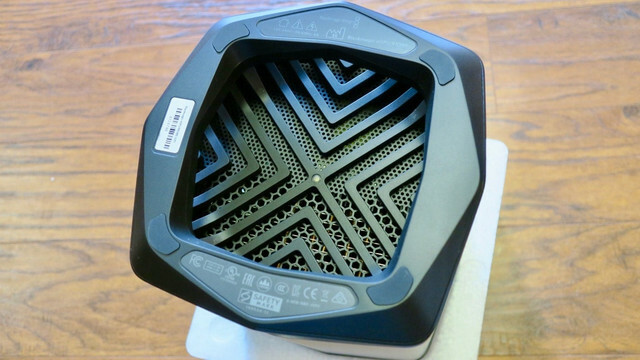 I don't see this product being really interesting compared to any other eGPU boxes. I'm sure all other eGPU boxes will get proper support on Mac if this is now official feature. Andrew Kolakowski wrote: It's clearly targeted for Apple, so this is probably why it's AMD. Fact that it's bit outdated and non-replaceable model is bad news. 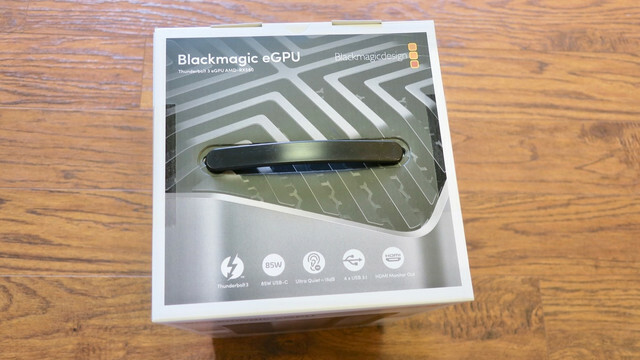 I don't see this product being really interesting compared to any other eGPU boxes. I'm sure all other eGPU boxes will get proper support on Mac if this is now official feature. A lot of them already have proper support. 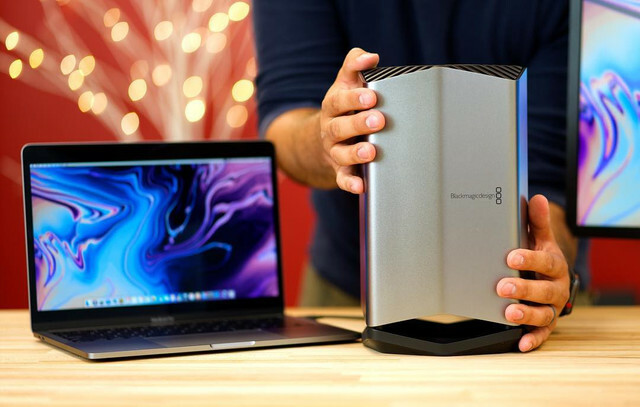 BMD's is more attractive and has a better than usual port cluster... but it's still not in the ballpark of, say, an AlienWare 15 decked out with an overclocked hexacore i9, a 1080 GPU, 32GB ram, and an eGPU using AlienWare's proprietary bus connector with another 1080 in it, though sourcing a 1080 would raise the price of AlienWare's eGPU chassis higher than BMD's, due to the cost of the GPU. The chassis itself is only around $250. It would be cool if BMD opened this chassis up for those who would prefer to choose their own GPU... or maybe BMD plans a higher spec model with a modern GPU in the future. To bo honest- I don't really get why it has to be so nicely designed. Are you really going to keep it on top of the desk? It's not a monitor which is cool when nicely designed. I rather had it hidden somewhere underneath desk, so there is no noise and I have clean desk and no cables. For me totally miss-designed product. It's shiny for no reason, except to follow Apple style. Last edited by Andrew Kolakowski on Thu Jul 12, 2018 4:32 pm, edited 1 time in total. Andrew Kolakowski wrote: To bo honest- I don't really get why it has to be so nicely designed. Because it's for Mac users. There's a long history of third-party products being designed to look good with Macs (same materials, colors, etc.). Plenty of us Mac users don't care how our computers look and could care less about appearances, but plenty of others are into the design and want everything to look consistent. I don't mind it when product has to be on the desk (eg. monitor). For eGPU for me it's not needed at all. I googled it and it's <GTX 1060 overall. Not sure how it translates to Resolve. Andrew Kolakowski wrote: I don't mind it when product has to be on the desk (eg. monitor). For eGPU for me it's not needed at all. 1. The new Pocket 4K camera is going to be very popular. 2. The new Pocket comes with Resolve Studio for free. 3. Lots of MacBook Pro users will be disappointed to find that their machines can't run this "free" program. 4. 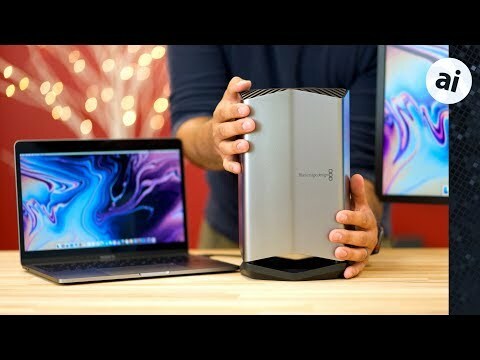 For only $700 they can (if they have a recent MacBook Pro with Thunderbolt 3) run Resolve without having to buy a whole new computer. 5. 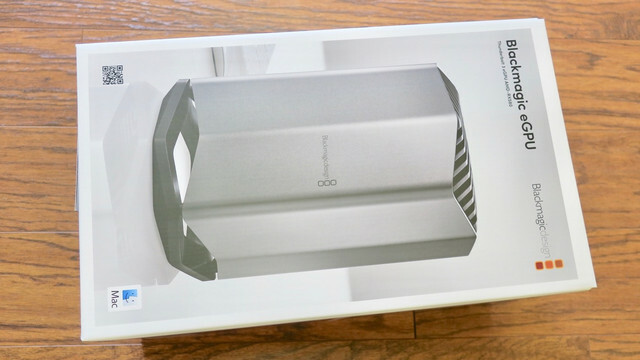 For those who care about these things, the eGPU is coordinated with the standard MacBook design and aluminum/black look. You can put it on your desk if you like and it'll look coordinated with your other Apple devices. The little booklet that came with the "trashcan" MacPro in your photo actually says something like "Don't hide this computer under the table!" I don't mind its "nice" design. In the same time I would be more happy if it would be plain aluminium box, but with well designed cooling and ability to change GPU. Not sure if this would offset "design" costs. I'm converted Mac user (after many year using Windows), but recently I'm starting to dislike Apple's decisions. Have work Mackbook Pro (15inch with touch bar) and older 13inch model. Problem is that I 10x prefer older model- new keyboard is terrible (lid is more flimsy and screen gets keyboard marks after closing it! ), touch bar is about useless, battery way worse, gets to hot (with default fan aggressiveness), some body elements can actually cut you (I'm surprised that it passes all safety checks). Recent announced models seems to keep this trend. Apple starts to produce form over the content and BM product also feels like this. Just a small complain Will leave pricing out of it as this is another big issue with Apple products in Europe. Last edited by Andrew Kolakowski on Thu Jul 12, 2018 6:05 pm, edited 2 times in total. Well- as much as I like Apple for every day usage I would never invest such a money to run Resolve. Sorry- this is simply not acceptable. This eGPU doesn't really change it much for me. Whole thing is still massive compromise- again form over content! 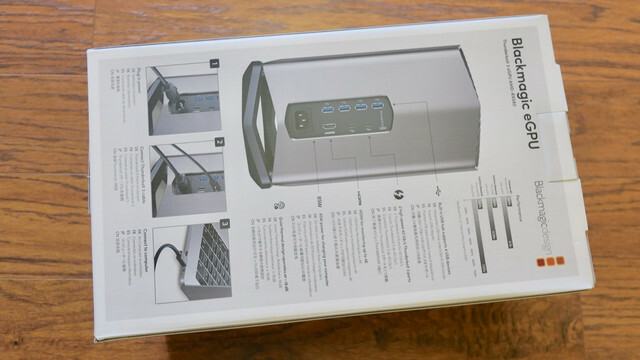 Machine needs Thunderbolt 3 for start+OSX has to be 10.13.5+, so NO. Ya, afraid only MacBooks Pros from 2016-present and iMacs and iMac Pros from 2017 will be able to use it. Because those are the Thunderbolt 3 models. Heard Apple is updating the Mac Mini this year. 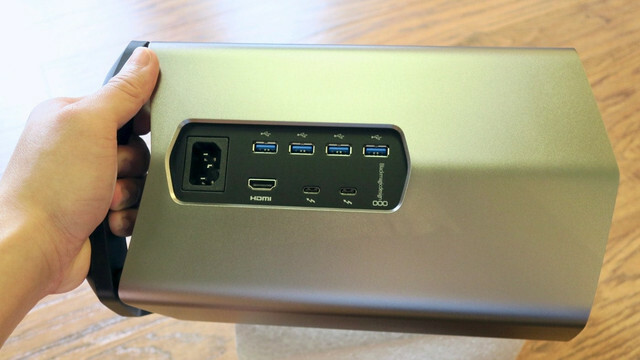 Hopefully they at least add one Thunderbolt 3 port to the refresh. It's a very attractive looking band-aid, meant to cover the fact that Apple has refused until quite recently to offer well-performing machines. Micha Clazing wrote: Not necessary. With Resolve all output frames are generated on the GPU so they can simply be DMA'd to the Decklink and no roundtrip to system memory is required. I'm pretty sure it is already implemented this way. On the contrary, bus mastering has very much been the standard since the mid nineties. It's what made it possible for Macs and Amigas to work with real-time video on relatively paltry specs. When you use the Blackmagic Decklink SDK, you can define a custom allocator, which allows you to use preallocated GPU resources. When you pass these to the Decklink driver, it will perform a DMA scatter gather operation to directly transfer data to/from the Decklink card, without touching system memory. That is probably more or less exactly what Resolve does when you select a Decklink card for monitoring from Resolve. Just ask any BMD engineer. Yes, but means it has to be bespoke solution. How are you going to take current card and "insert" into this box away from host machine? How is it going to talk to GPU? It needs PCI-E link etc. It can be done, but then it's bespoke solution with custom design. 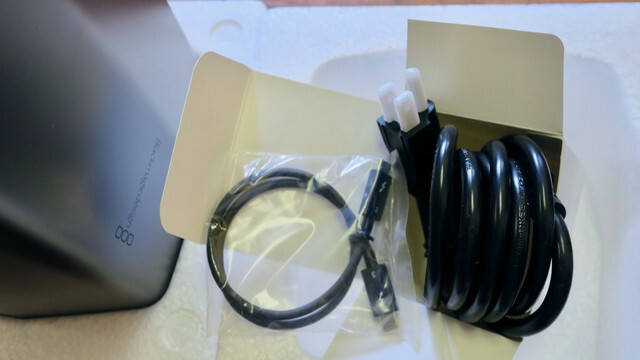 In case of "standard card" you could simply connect box over 2nd TB3 port (I assume this is possible) and have it seated into standard PCI-E port which would go to host (but then data travels to host and back, which ideally you would like to avoid). It may be simply not worth it for Resolve. Resolve has to push 32bit float frames to GPU over TB2, so this is not going to work very well in case of 4K+. 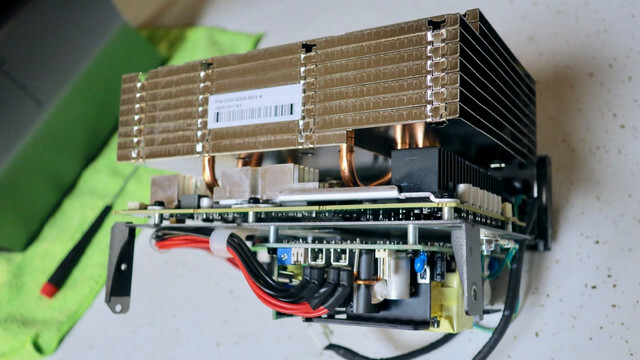 GPUs may not need whole x16 PCI-E bandwidth all the time, but in the same time TB2 bandwidth is simply to small for universal eGPU support. Even TB3 is bit to small for "perfect" case. You probably need x8 PCI-E gen3 and TB3 is only x4. Andrew Kolakowski wrote: It may be simply not worth it for Resolve. Resolve has to push 32bit float frames to GPU over TB2, so this is not going to work very well in case of 4K+. GPUs may not need whole x16 PCI-E bandwidth all the time, but in the same time TB2 bandwidth is simply to small for universal eGPU support. Even TB3 is bit to small for "perfect" case. You probably need x8 PCI-E gen3 and TB3 is only x4. Agreed. This is a way under-powered piece of hardware will not nearly the RAM needed for 4K workflows. IMO. 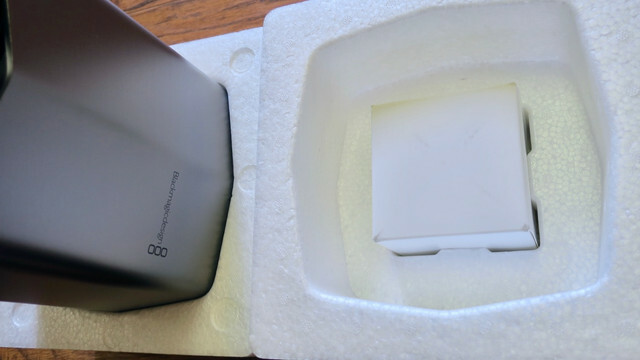 Its like a $700 Macbook life extension box. Andrew Kolakowski wrote: Yes, but means it has to be bespoke solution. How are you going to take current card and "insert" into this box away from host machine? How is it going to talk to GPU? It needs PCI-E link etc. It can be done, but then it's bespoke solution with custom design. If by "bespoke solution", you mean a PLX bridge chip to add a second PCI-e interface to the enclosure (which it likely already contains, since it also has TB3 downstream ports), and have a Decklink Mini Monitor integrated on the PCB, then yes. That kind of bespoke. That's why it's a BMD product; you would expect features targeted specifically at Resolve users. If by "bespoke solution" you mean anything else, then no. 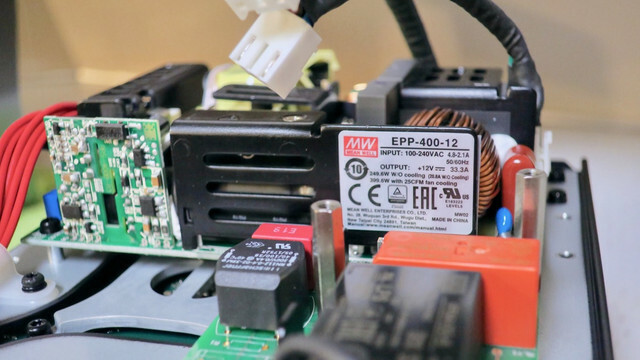 Bus mastering PCI-e devices are peers, and so are fundamentally different from say, USB devices. You can transfer data between two devices without round tripping through the host. This is all standard topology, nothing bespoke about it. BMD controls the hardware design and maintains the Decklink driver, so this can all be supported trivially without any special support from anyone else. I don't see the purpose of this device. No one can grade properly on a laptop screen unless hooked to other monitors. This device isn't portable to lug around so it's for desk work only. Maybe could be used on a DIT cart? I guess it's just for people that don't have expensive workstation and only a laptop. 1st option. In this case it would be more attractive box which would serve 2 needs: give GPU power and also allow for accurate monitoring. It probably could be done at not that high additional cost. I've been researching the fast-developing eGPU world, because I ONLY want a laptop, but I want to be able to crunch serious data when I need to. First off, I should say I am (like most here) DEFINITELY a "power user". I use Resolve Studio, I'm coloring 4K files, with noise reduction, as well as RAW 1080p files. I also use Photoshop and After Effects a ton, and FCPX for its crazy fast transcoding abilities. But I only want a laptop, because I bring my computer to work every day, plop it on my edit desk, next to my edit workstation. When I come home, I want to plug it into my 4K monitor and use it as a desktop (I've done the whole "have both a desktop and a laptop" thing, and it drives me crazy having to keep everything synced, media, project files, render files, etc. etc. etc.) I want to plug and play immediately. So, an eGPU is the perfect solution. I come home, plug my one cable in that leads to the eGPU (which in turn leads to the monitor), and now I have a beastly rendering/playback station straight out of my laptop. 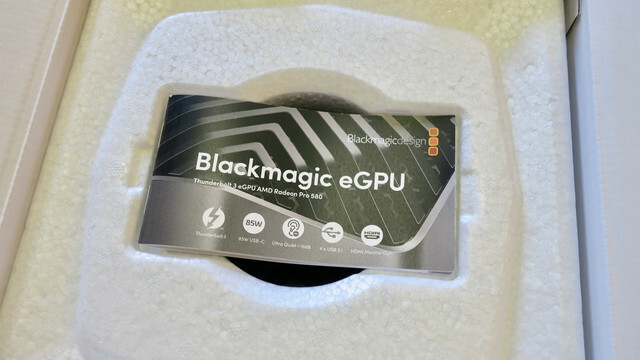 Anyway, as an educated eGPU buyer, I'd say this is an interesting offering. to BMD : why my post is on post produzione section ? i posted it on resolve forum. so why u move it ? Hard to believe this is bigger than the new Mac Pro for a relatively modest GPU. All about airflow. BTW, they clearly state it is active cooling: "this allows the variable speed fan to run more slow". 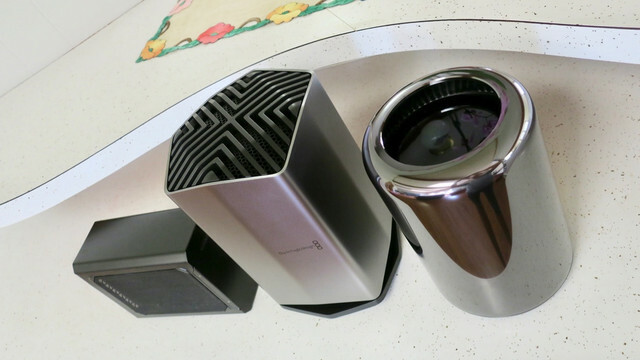 Would this actually work with a Mac Pro, though (the trashcan model shown in the photos above)? 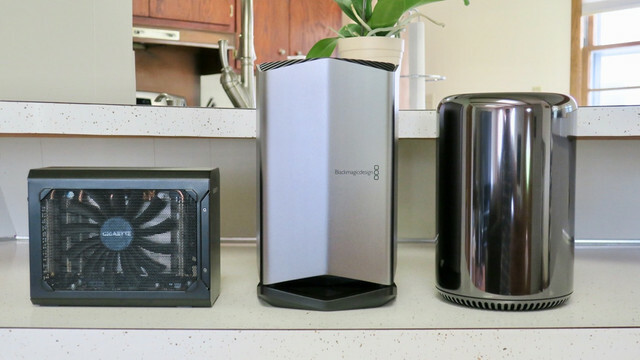 The MacPro only has Thunderbolt 2, and while you can use an adapter to connect to TB3 devices I wonder if the bandwidth of TB2 is high enough to be worthwhile for eGPU applications? Read FAQ. TB2 is rather to slow for GPUs. So fan is at the bottom? 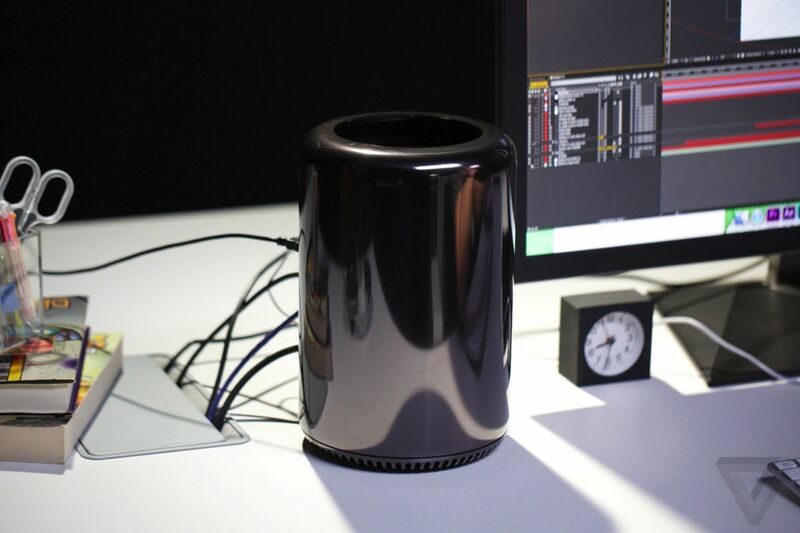 Looks like Mac Pro based design. both GPU and memory are underclocked (10,15%) against gaming cards with the same GPU. Does the egpu support HDR?